Last week saw the final elimination round matchup, with Macy Chiasson finishing Larissa Pacheco to punch her ticket to the semifinals that will kick off on the next episode of The Ultimate Fighter: Heavy Hitters. With only four fights remaining this season, the semifinals are comprised of four fighters from Team Whittaker and four fighters from Team Gastelum. Each of the bouts will see the two teams oppose each other, so there will be no training partners forced to face each other to get to the finals on Nov. 30 in Las Vegas. The heavyweights will be the first ones up this week as former Cuban Olympic wrestler Michel Batista looks to build on his impressive win in the opening round when he faces dark horse contender Justin Frazier, who came into the competition extremely overweight and then knocked off middleweight champion Robert Whittaker's No. 1 pick on the show. Before the fight gets started this week, there will still be plenty of fallout to deal with from the last bout between Chiasson and Pacheco, but not because of the fighters involved in that particular women's featherweight showdown. Instead, the ruckus will come from Team Gastelum heavyweight Maurice Greene, who has been one of the loudest and most outspoken fighters on the entire show this season. Now part of Greene's attitude comes from his stunning performance in the first fight of the season, where he got things started with a bang as he knocked out Przemysław Mysiala in the first round to get the ball rolling for Team Gastelum. Unfortunately, since that time, Greene hasn't been seen as a workhorse in the gym nearly as much as he's been a disruption at the house thanks to his constant drinking. What started as a celebration following his victory to kick off the competition has turned into one gigantic, never ending party for Greene as the hard hitting heavyweight always seems to find an excuse to knock back a few drinks whenever he's at the house. That behavior has resulted in Greene staying up late at night, disturbing his fellow housemates, and he's managed to get into verbal altercations with at least two of the fighters in his division. First up was Juan Espino, who Greene initially considered a friend when they arrived at the competition several weeks ago. They ended up being drafted to separate teams and Greene felt like Espino had been slighting him ever since. The very loud incident that took place just before Espino won his fight to move into the semifinals ended with Greene issuing an apology for his disruptive behavior. The second incident started to unfold last week, with Greene and teammate Justin Frazier arguing with Team Whittaker fighter Anderson da Silva while they were playing pool and knocking back a few drinks. Da Silva, a former kickboxer turned mixed martial artist, actually holds a win over Greene from a past encounter and he decided to remind him of that fact when they were chatting in the house. Obviously, Greene didn't take too kindly to da Silva giving him a hard time and they ended up in an argument that was certainly heard by everybody in the house. That tumultuous relationship will continue to boil over in the latest episode, with Greene's belligerence going overboard yet again while taking aim at da Silva and seemingly anybody else who steps in his path. 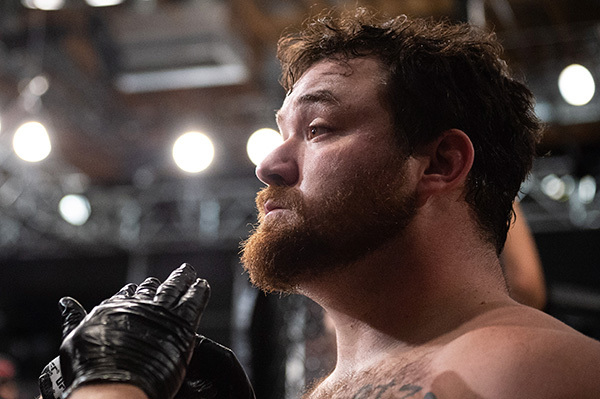 Greene isn't the first fighter to struggle with alcohol on the show — more than a few past athletes have faced those same demons while competing on The Ultimate Fighter for a chance at a UFC contract. Back in season one, Chris Leben notoriously dealt with a drinking problem that was only compounded by a bitter relationship shared with Josh Koscheck and Bobby Southworth. And who can forget Junie Browning, who made a name for himself largely because of his bizarre behavior while drinking a little bit too much rather than staying focused on training. Obviously, Greene would rather not fall into that category, but his disruptive behavior will send a ripple through the house and the gym this week and leave at least one fighter on the verge of potentially leaving the competition. On a much happier note, the contestants on the show this season will also look to celebrate their time together with a memento that won't be erased when filming is complete. That means a trip to the local tattoo parlor for the fighters to all get a little bit of ink to commemorate their time on the show together. As for the fight, this matchup will showcase two fighters who were very dominant in their opening round victories. Batista is still very much a raw athletic talent learning on the job, but he might have the single best weapon of anybody remaining in the competition. Batista is a world-class wrestler with explosive takedowns and great ground control as well. Batista showed off his grappling skills in his dominant showing against Dana White’s Tuesday Night Contender Series veteran Josh Parisian in the opening round. Batista has also benefitted from education he's been given by middleweight champion Robert Whittaker, who is routinely regarded as one of the best strikers on the entire UFC roster. That combination is going to make Batista awfully hard to beat. That said, Frazier is a scrappy, hard-hitting heavyweight who carries a never-say-die attitude with him at all times. Frazier was the last pick for his team in the heavyweight division, but that didn't stop him from cutting the extra weight he carried onto the show and then putting on a stunning show in his debut fight. Now Frazier will once again look to shock the world by taking out Batista in the first heavyweight semifinal. Can he pull off the upset against the former Olympian? Tune in to The Ultimate Fighter: Heavy Hitters tonight at 10pm ET on FS1 to find out what happens.